BEFORE: Crammed and jammed. Great clothes, not grouped by type. Too much, doesn’t fit, worn out or outdated. So many things she’ll never wear again. Shape of closet is a challenge. 2. Quick fix — Switch to skinny hangers to maximize closet rod space (Joy Mangano makes great ones). 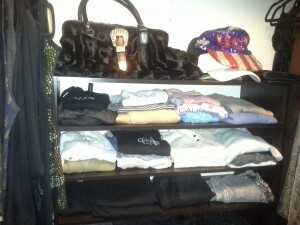 If you have items you rarely wear, but must keep, put them in the far corners of the closet. (Santa outfit, High School Cheerleader outfit you simply cannot part with yet!). 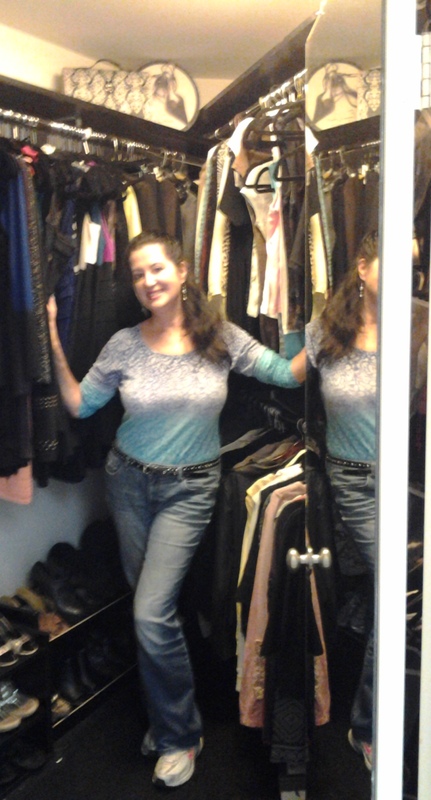 This closet does have its challenges or being shaped live a V.
AFTER: Group by type; then light to dark on skinny hangers to maximize the space and make it fun shopping in your closet. Wear your jeans and work-out shoes. Heavy lifting involved here! 3. Quick fix — Add portable horizontal shelving and/or shelf dividers (I like the ones from Target – Espresso shown here). Horizontal shelf dividers are great for folded items. Look how much vertical space we captured. These formerly hung knit tops can now be grouped and seen easily. 4. Fun reward — Create a boutique experience in your own closet. Add some bling with your couture items. You might even want to reserve a shelf for bracelets and special jewelry. 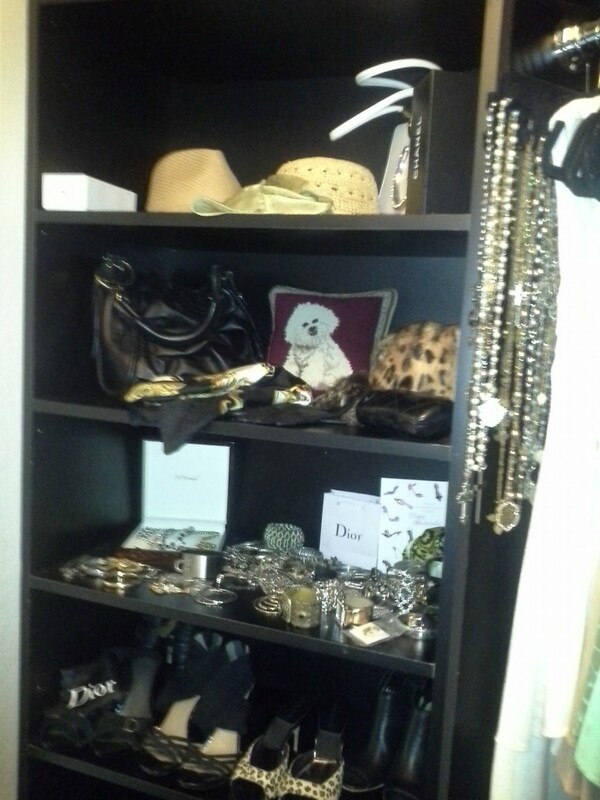 Make one area super pretty like your own private boutique! Love those gorgeous yet practical vignettes. 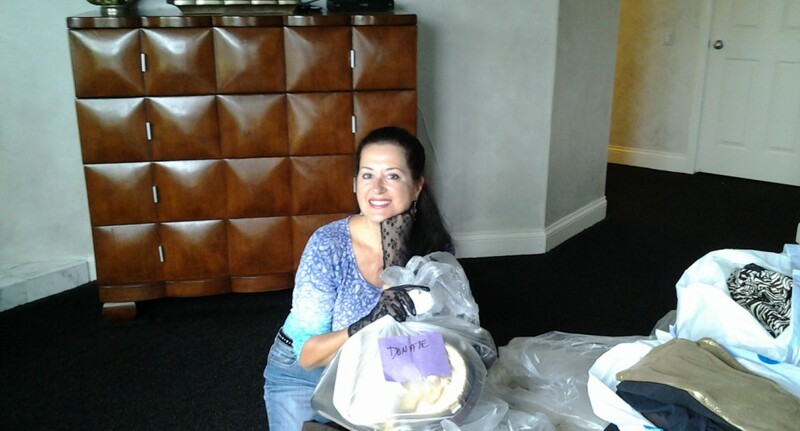 Tips: Take your items out of the house immediately (or have your professional organizer do it for you). Don’t tempt yourself to go through the bags and retrieve anything. Make some money at the consignment shop. The next woman will love those things that gathered dust in your closet! Take your designer items to a nearby Consignment Shop. Check, please $$$! My Sister’s Closet in Encinitas is awesome. Set up an account with a nearby consignment shop. Check, please! 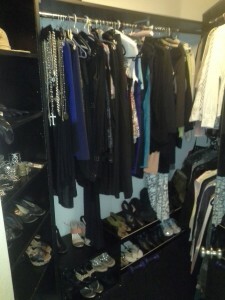 My Sisters Closet.